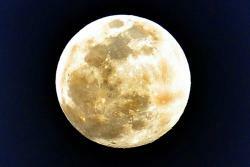 A recent 'supermoon': Jessie Eastland [CC BY-SA 4.0 (https://creativecommons.org/licenses/by-sa/4.0)]Dr Mattias Green of Bangor University, in collaboration with researchers from Royal Holloway, University of London, have netted a research grant worth £520K from the UK Natural Environment Research Council (NERC) to tackle a major question in the understanding of the history of the moon. 50 years ago, on the July 20 1969, the Apollo 11 space mission landed on the surface of the moon, with Neil Armstrong and Buzz Aldrin becoming the first people to set foot on the moon. In what was one of the greatest achievements of human civilization, they brought back rock samples which showed that the moon was 4.5 billion years old, and so must have formed only 200 million years or so after Earth formed. The astronauts also left mirrors on the surface of the moon so that lasers could very accurately measure the Earth-moon separation. These laser measurements estimated that the moon is moving away from the Earth at a rate of 3.8 cm/year. However, at this rate the moon could only be 1.5 billion years old, otherwise it would have been torn apart by the Earth’s gravitational field. These two observations lead to an obvious paradox: the geological age of the moon and the rate at which the moon is moving away from the Earth don’t add up!